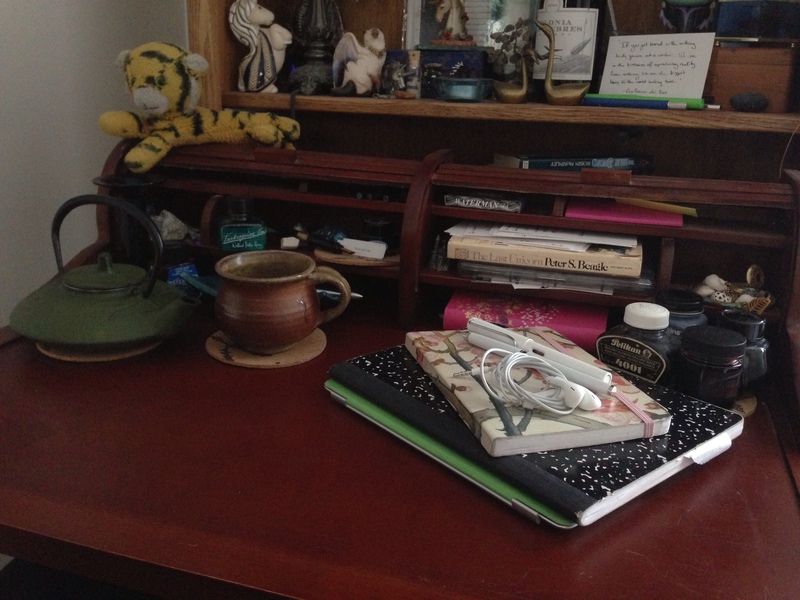 My Writing Process (with pictures) – The official blog of Michelle Tuckett, word ninja. Over time, I've often been asked a lot to talk about my writing process – the nuts and bolts of what I do when I sit down to write. And so far, I've resisted doing so, partly because I don't really know if I have a writing process, and partly because its a very self-conscious thing to do, to pay attention as you write and figure out what is it exactly that I do? So I have been watching, very coyly and indirectly, so as not to frighten myself into doing strange things like starting to smoke a pipe or drink absinthe merely to seem more writerly. And I've been able to piece some of it together. But I have to clarify that this is not how I *always* write, it's how I write when I feel like writing this way – particularly when I need to feel more professional. In truth, it's probably how I write only 30-50% of the time. I've logged more words and writing hours in the last year flopped on the sofa with a cat next to me and marathons of Buffy the Vampire Slayer in the background than I have at a desk. Choose caffeinated beverage and preferred seating area. Commence writing. There. If this is enough for you, feel free to go about your day. Anyone looking more for the full monty, let's keep going. And by no means should anyone try to replicate my way of doing things. This is what works for me, and everyone is different. I normally stop on my way home from work at a coffee shop to get in a few hours of uninterrupted writing time before obligations of home (cat, laundry, friends, Netflix) can drag me in and distract me, and I've made a point of posting pictures (like the ones here) of where I'm writing over at the Facebook page if anyone wants to follow along. Today, I don't particularly feel like getting dressed in real clothing, so I'm working at The Desk at home (more on The Desk another day). I chose a pot of hazelnut black tea, and gathered my tools, which are always nearby in my bag – I select purses for being iPad-and-notebook friendly. When not at home, I choose a cafe with wi-fi and plenty of comfy seating. I prefer places where people go to study, places with 50¢ refills and quiet music on in the background. Though sometimes, I opt for a moody bar and whisky, if the writing demands it. I usually start with checking in with the outside world – Facebook, twitter, a cursory glance at my email, sending a text or two I needed to send, maybe returning a quick phone call, just to clear off my to-do list, or to get used to the idea of sitting and working. I'll use this time to play a small game of some kind if I'm feeling reluctant or if my mind is busy from the day. Sometimes I stare at people or out the window. I fidgit, and I daydream, I listen to a song I've been humming all day. I like to put in my headphones whether I'm at home or out, even if I don't play anything on them. Few things say “don't bother me” in the same way. I generally listen to music to set the mood of my writing. Sometimes I listen to ambient noise of brain wave stuff, or I'll have nothing at all and pretend to work while I take notes on the juicy conversation at the next table. After maybe twenty minutes, I begin. The caffeine and routine have worked into my system enough and I'm ready. Even if I'm not ready, I get to work. The time I spend working – whether it's a few hours or thirty minutes – is mine, and I do what I want as long as it's toward the ultimate goal of having written, or having expanded my little writing empire online. Some days I like to start with fountain pens and notebooks. I like to write by hand when I feel an extra reluctance, or when I need to ease into a scene, write lists of things to think about or do, or just to feel the weight of a pen in my hand. Some things need to be hand written first, and others need the clarity of typing them out, the secure feel of consistent font. Most of the time, I write on my iPad. Ever since I got it last march, it's my favorite thing ever. I keep a notebook at my elbow for quick notes and brain drains while I work, and I write whatever is going to be written that day. Sometimes, like today, it's a blog entry. Other days, I have a flash of insight and want to get to work immediately on a scene or a new idea. Sometimes it all snaps together like Legos. Sometimes it's like building with old wooden blocks that are warped and rounded at the edges, and I know it's rickety and needs a lot more work. But I have made the shape I want, and at the very least I can build it again out of sturdier stuff. Sometimes I write snippets from several different scenes, scattered across several files. Sometimes I write one long, contiguous piece, and sometimes I rewrite something that still doesn't feel right to me. 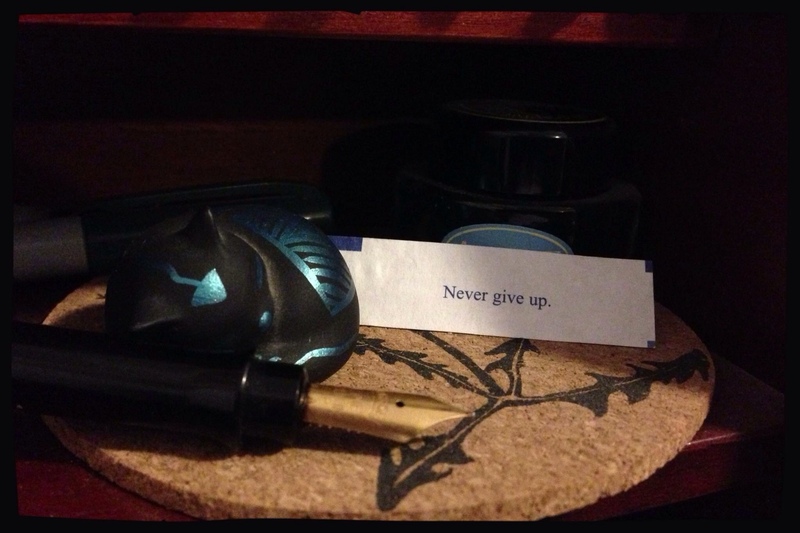 But no matter how it goes, if I've sat down to write, writing gets done. There is no other option. Generally, I get around 2,000 words done. Sometimes more, rarely less. Unless I'm trying to reach a monthly goal like last year, I don't worry about how much I do. Some scenes need to be written slowly and with care, they need my full attention on them like a friend in crisis. Other scenes are easy and fall out in large chunks of words and scarcely need more from me than to be the one to write them down. I allow some distractions while I work. I respond to texts and messages within reason. If someone I know comes in, I'll stop to chat. I'll update Facebook, or tweet. I let myself research until I find what I need to continue with the story (and since my current novel involves a lot of history and phrases from other languages, I do a lot of quick googles in the middle of a thought). If possible, I do research on my iPhone to ensure I don't fall into a information hole. But if I do get sucked in, it happens. I just pull myself out and write more. I do my best to not stress about these kinds of things, the interruptions and blips, and to trust myself. I'm a writer, I am writing, and as long as that keeps happening, I don't worry much over the small things like how much or little I can use from my day's work. It's all building the shape of what I want, each day getting closer. There is one thing I never let myself do: I don't look up writing advice in my writing time. Its better to have a big sloppy rough draft done than have wasted another hour or day reading about how to do it. If I need encouragement, I'll look for it later. Writing time is for writing. Period. If I get stuck, I switch tasks, or stare out the window more, or just muscle through it and write bad, awful, terrible prose. Some days I leave cranky and irritated with how it went, other days I feel empowered and ready to take on the next step. Sometimes it's like I'm lost in a fog with no compass and an inner ear problem, other times I can see the sprawl of my plot like a view from space. But my day is always better if I've had time to write. This is all how the process goes – when there is a process. I strive to never be chained to one way of doing things, but to be fluid with life – there isn't always a coffee shop or desk nearby when I need one. I've been known to write some of my best stuff curled on irowboat's sofa while he played Arkham City or Tomb Raider next to me. 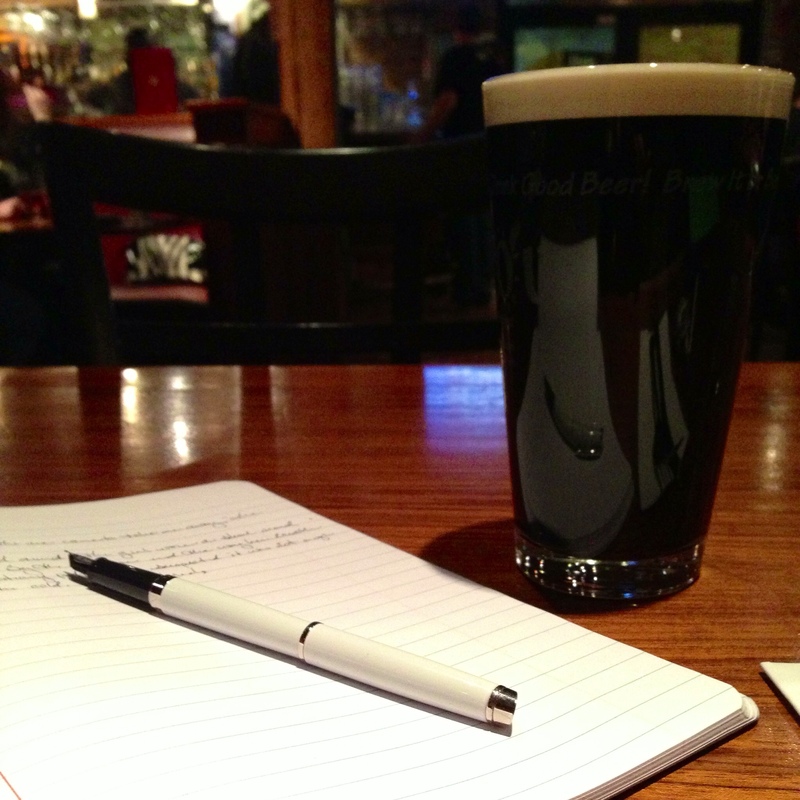 I've been known to whip out my pen at parties, and to seek out corners in bars to get some notes down. If you've come all this way with me, awesome and congratulations. Now go write something with your own process, and don't give mine another thought. Thanks for the great description of your process. I particularly like your description of the writing as blocks. I have so many rickety towers of old warped blocks! But at least there is something to work with. The best line: Writing time is for writing. Amen! Ah, yes the infamous writing process. I am a bit messy when it comes to writing, I aim for 3000 words a day and usually get there. My plan is to write in the morning and go over it in the evening but it is often the other way round. I like Ernest Hemingway’s writing advice though: Write drunk, edit sober. Great line – writing time is for writing. Agree! Also, like your desk set-up, very appealing. I go for Pepsi to get me going but like tea as well. Happy writing today! Totally LOVED this ~ thank you!!! “Watching very coyly and indirectly, so as to not frighten myself..” — a lot like a Buddhist exercise to see the Buddha Nature — can definity be scary, depending on how many are watching! very cool, as are the photos. Thanks for sharing! I quite enjoyed reading about your process. I am curious about one thing, however: how do you write on the ipad? Do you use a wireless keyboard, or do you do all your typing on the actual touchscreen? I like it so much better when the writing demands a moody bar and whiskey. 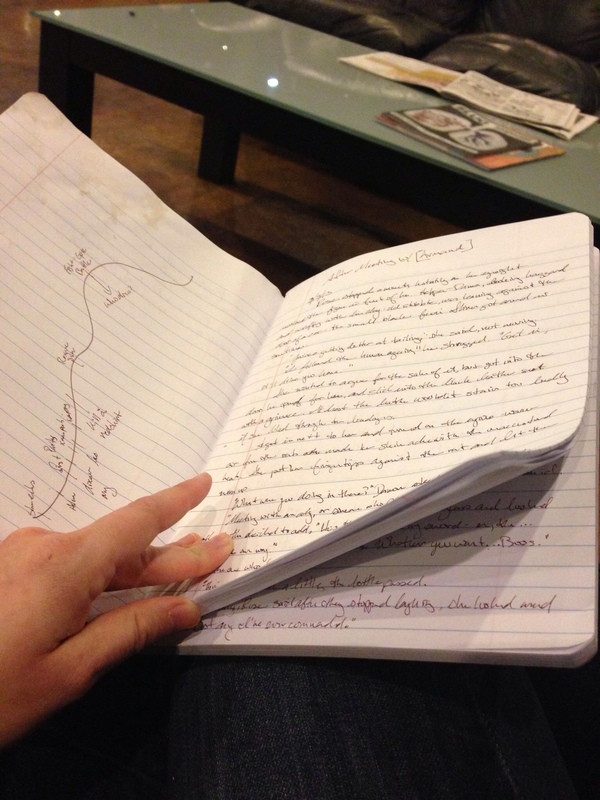 Our writing processes are very similar…I find myself doing a lot of the same things!